Congratulations to the Jazz band, Dance Team & IDL for a series of spectaculars spring performances! Last night the Jazz band played at the Jazz Club Vitello’s and sounded awesome! Today IDL and Dance Team performed at our spring pep rally and rocked the house! It was definitely a good day to be a husky! Happy Spring Break everyone and we’ll see you in a week! 2019-20 Drum Major & Dance Captain Online Applications! Band and Dance Team members applying for the 2019 – 20 Drum Major / Assistant Drum Major or Dance Team Captain / Lieutenant must complete the online application by clicking the link below. In addition to answering three questions, applicants need to write a one-page letter to the Band & Dance Team explaining why they should be their next leader. This letter will be posted in class for students to read once we return from spring break! Applications for the Royal Regiment Band and Dance Team Leadership Council are now available. If you are interested in strengthening our program by being a positive & hardworking role model for students, please consider joining our leadership team. It is a great opportunity to work with your peers to problems solve musical & social issues in the program. Interested students may apply NOW! All returning band & dance team students are eligible and welcome to apply! The 2019 Dance Show is in just a few short weeks. In order to prepare for the show, Haziel has posted some additional rehearsals. 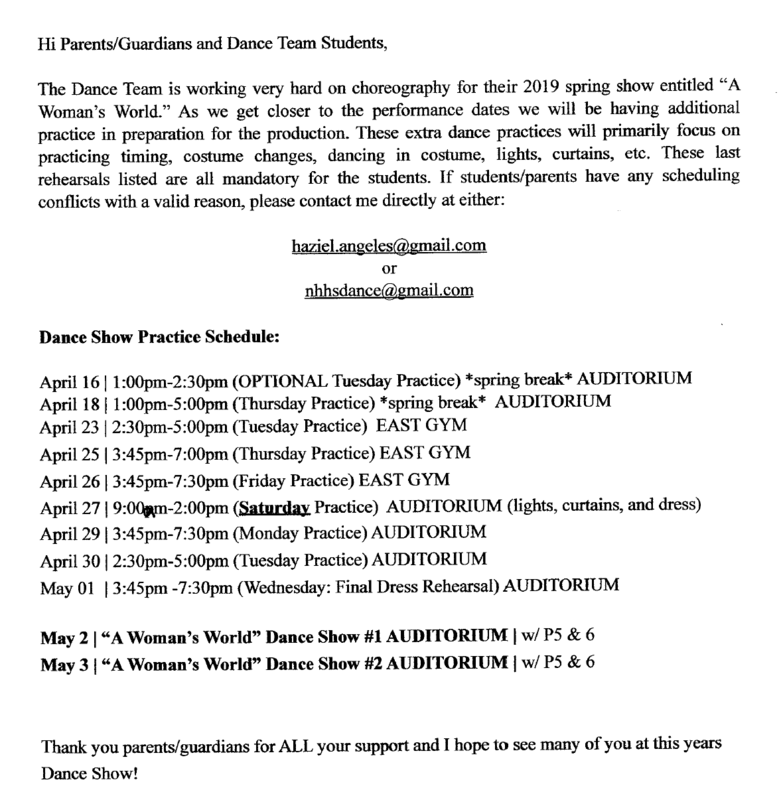 Dance Team Students should review the schedule below with their families. If there are any scheduling issues you should email Haziel ASAP! Thanks!